Please join us for this exciting forum, Transforming the Suburbs, in which the panel speakers will explore the transformative role of Australian suburbs to activate the behavioural change, cooperative-based action and practical solutions required for rapid transition to a carbon-positive low energy future. 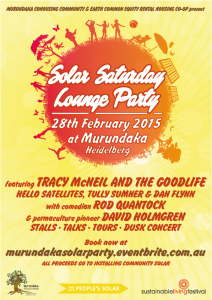 The event will be MC’d by Nick Ritar from Milkwood Permaculture. This expert panel will creatively explore sustainable actions, key strategies and resilience-based concepts for future suburban responses to localised and global ecological challenges. The audience will be provided expert analysis and thought-provoking ideas on how suburbia will be a vital place to survive and thrive in challenging futures. Discussion will actively engage and inform event participants about multi-faceted transitional change ideas that positively contribute toward low-energy and carbon positive sustainable home and community living. 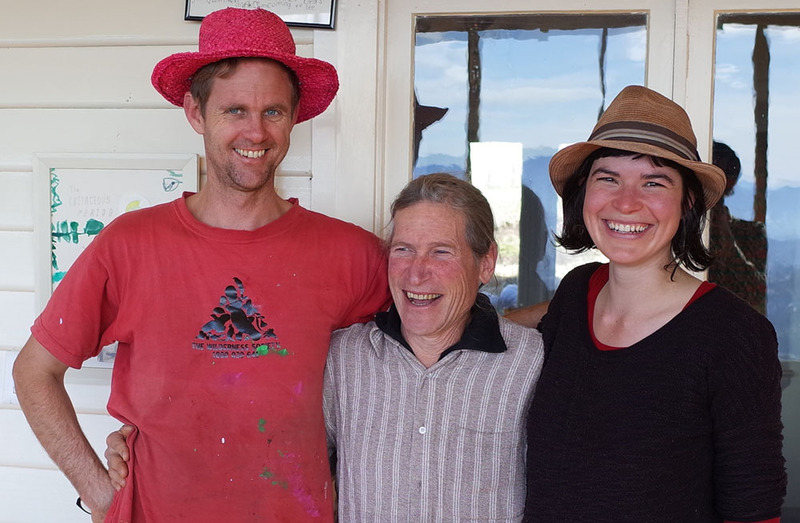 For anyone interested in permaculture, or a shift towards creatively adapting to a more sustainable way of living, this free event is not to be missed. How come permaculture co-originator (an old codger) David Holmgren is using a surfing metaphor to talk about suburbia at the Rainbow Serpent festival, in the dry inland, to mostly young people who don’t own a house and have most likely recently escaped suburbia to find their way in the world? David traces the history of suburbia from the 1950’s through to the present and on into a challenging future that is already unfolding using an entertaining and edgy story about his imaginary but amazingly true-to-life Aussie Street. While many young people are now questioning the idea of debt to become home owners, few can see a pathway forward that will give them some capacity to create the world they do want. David shows how getting out of debt, downsizing and rebooting our dormant household and community non-monetary economies are the best hedges that ordinary citizens can make. The idea that these household and community economies could achieve unprecedented growth rates if the monetary economy takes a serious dive, is a good news story you won’t hear from mainstream media. The metaphor of surfing suggests a stronger role for positive risk taking behaviour change without the need for expensive changes to the built environment that few will be able to afford. 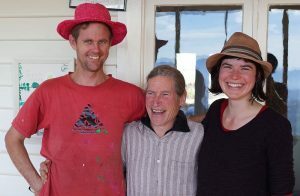 The permaculture makeover and behaviour change in a retrofitted Aussie St allows the residents to not only survive but thrive through the “dumpers” of the property bubble collapse, climate chaos and geopolitical energy shocks that hit the lucky country in the Second Great Depression of the 2020’s . An endearing, amusing and gutsy story of hope for in-situ adaptation by the majority of Australians living in our towns and suburbs. And if you think it is just a dream, check out some of the examples of Aussie Street style retrofitting of the suburb. Hulbert Street in Fremantle, WA is a great example. Here, a driving force behind neighbourhood remaking, Shani Graham, talks about her experience in a Tedx talkfest in Perth. A permaculture activist in the Blue Mountains in NSW, Paula Ajuria informed us late last year that a neighbourhood retrofit is underway. We are sure there are many other Aussie Streets out there, and hopefully after Rainbow, there will be many more. Come and see how the real Aussie dreams are made at Rainbow. What is going on in the world? What can we do about it, you wonder? Climate change, peak energy, and global finance seem to be the biggest worries of many people. Naturally so, because according to David Holmgren, they are the key elements deciding our world, and our future. How are these factors behaving now, and how are they likely to behave in future and, more importantly, how will they influence each other? What’s the future hold for us? 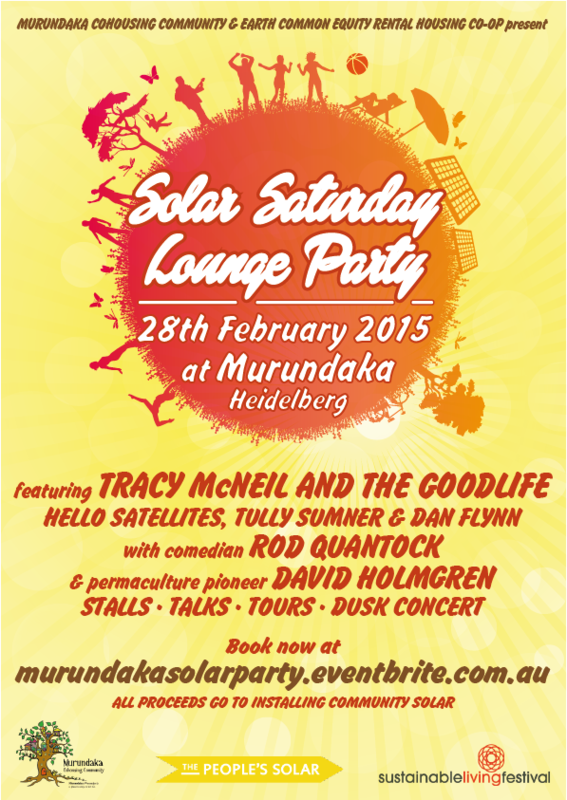 This exploration of our future is very fittingly to be held in Canberra, Australia’s capital. 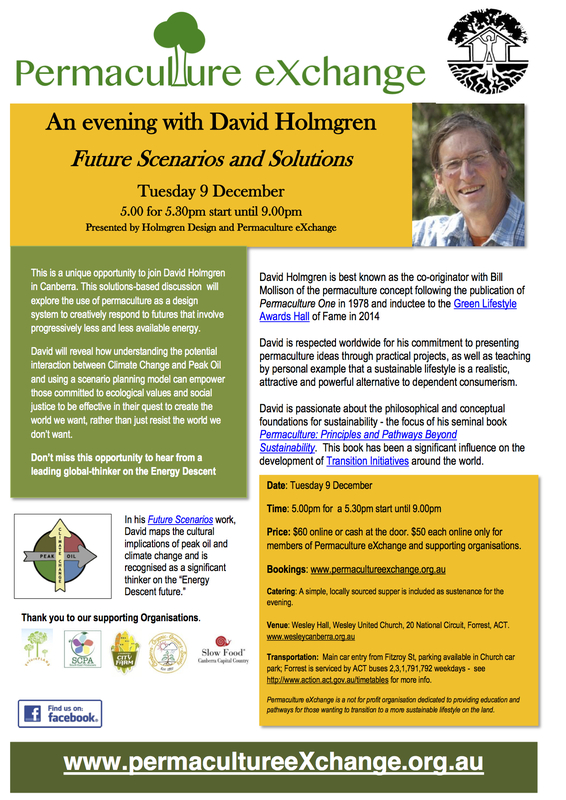 Holmgren Design, in association with Permaculture eXchange, SEE-Change ACT, SCPA South East Producers, Urban Agriculture Australia, Canberra City Farm, The Goulburn Group, Slow Food Canberra and FuturePLANS is pleased to announce this extensive presentation and Q and A evening to discuss such profound matters with David Holmgren will be held in Canberra on December 9. David will outline first where we are at, and our likely future. Then he will offer a permaculture solution. 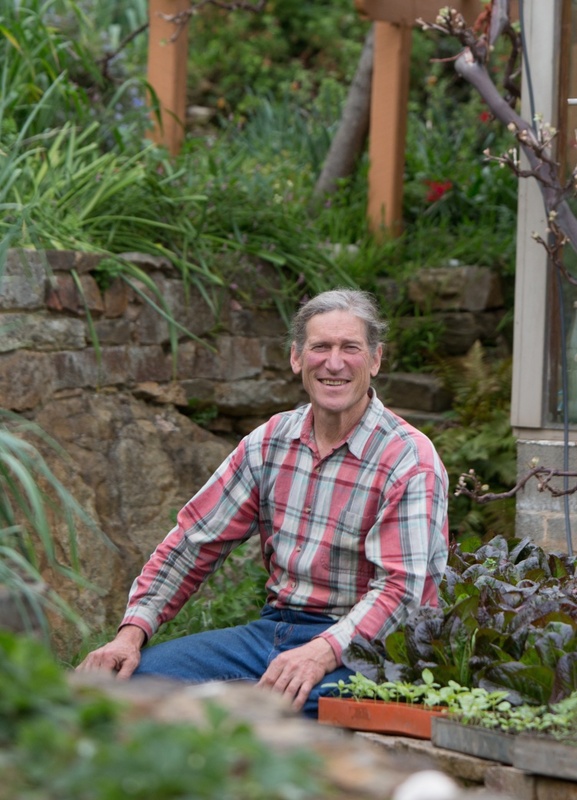 He will offer direct practical strategies in his presentation to help households and communities survive, thrive and contribute to a better world, drawing on 30 years of permaculture living, teaching, designing and building agricultural food production systems for sustainable living. Please do not miss this limited opportunity (David rarely travels even interstate). Be part of the session to figure out what is on offer and what we can do about it. Be part of the solutions thinking. 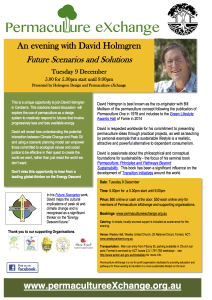 David Holmgren gave a Lunchbox/Soapbox talk at the The Wheeler Centre in February 2012, exploring the profound improvements that the application of permaculture principles and strategies could deliver for the sustainability and liveability of today’s suburbs. Through the microcosm of four adjacent houses in ‘Aussie Street’, Holmgren demonstrates how suburbs can and will respond to the converging economic, energy and climate crises, and discovers how you can stimulate positive household and community resilience in the face of these pressures. Watch the video and add your comments. Adapted from public lecture given at the Aldinga Arts Eco-village in Adelaide in January 2005.